Maintaining order and functionality in the kitchen is something that we all look for when it comes to the design of our home. We need to take into account storage space, such as cupboards and shelves. This is essential to a harmonious design that maximises the space available. Shelves in the kitchen are functional but they are also beautifully aesthetic. There are also all sorts of styles and types! 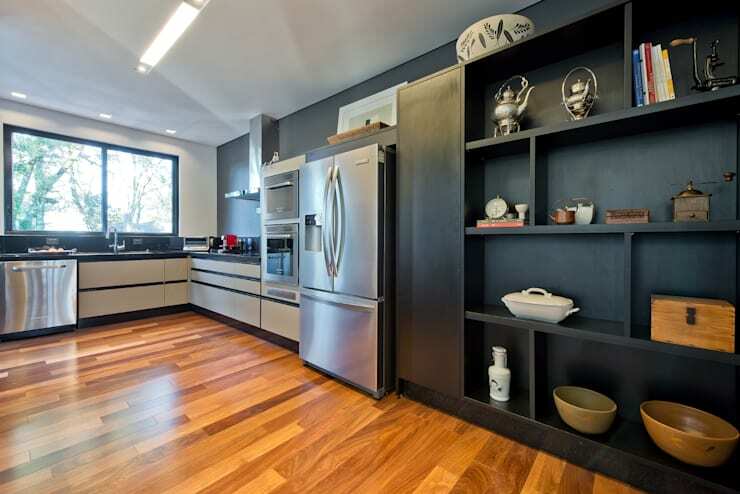 You can opt for closed shelves, open shelves, hidden shelves or shelves that are the focal point of the kitchen! So today at homify, we are going to look at some ingenious and beautiful kitchen designs that you simply have to show your carpenter! If you're looking for a functional and classic kitchen, choose this bookshelf design! Modular and custom-made, this is the best way to make the most of available space. You can create shelves from floor to ceiling! The combination of materials such as granite, concrete, wood and metal makes for a very versatile and modern industrial look and feel. Don't you love how the black frames enhance the modular design of these shelves? They are suspended from the ceiling, creating a very unique touch! Advances in LED technology have made electrical installations very unique and interesting. 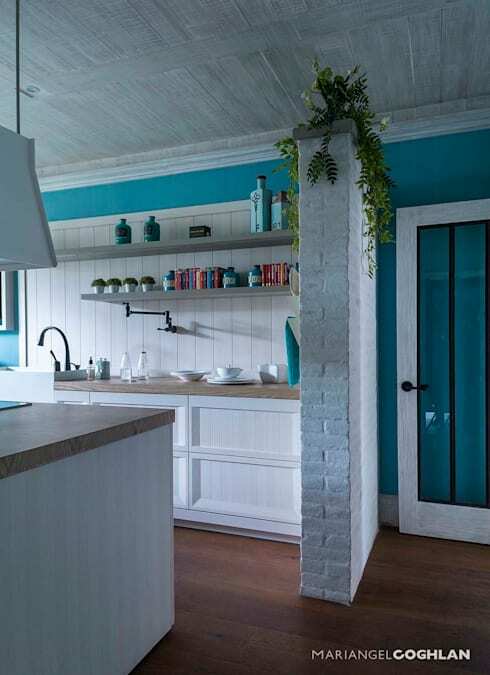 In the kitchen, they can change the mood with just one click! They can create a warm, inviting and functional space. 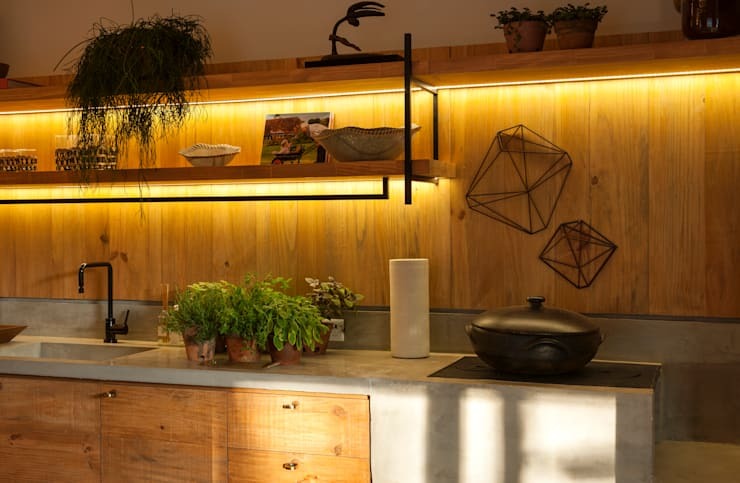 They can also illuminate the details of the kitchen! Use them under the shelves to create a beautiful form of storage. Sometimes less is more. This kitchen features simple, linear shelves. 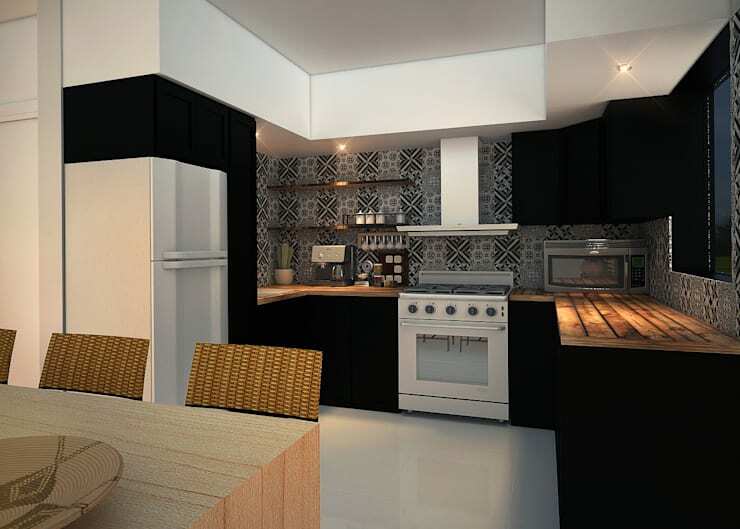 The horizontal elements emphasise the size of the kitchen. They can be made from any material of your choice, including glass, steel, concrete or wood. Paint the walls a bright colour and then use light wood or white for the shelves to make them stand out. For a solid appearance, there is nothing better than steel to coat the surfaces with a modern, chrome finish. Stainless steel shelves are also very sustainable and work in harmony with any kitchen design. If you like a bit of edge, opt for grey, black, red or grey. For a cosy, rustic chic look there is nothing better than typical, open wooden shelves. 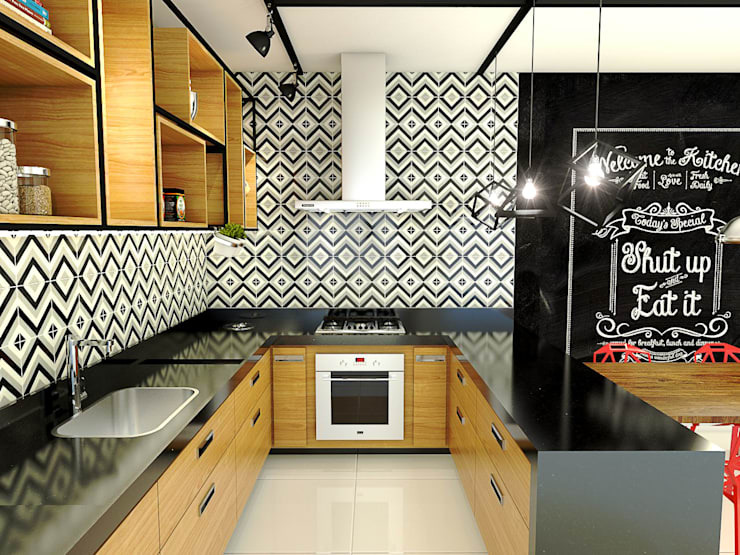 This allows utensils, recipe books, groceries and ornaments to decorate the walls of your kitchen. This is the best form of storage because everything remains easily accessible. Buy cutlery and crockery with bright patterns and eye-catching designs! Just remember that if you go for this type of design, you need to keep the shelves clean and tidy! Kitchen islands are very useful elements, complementing both the design and the functionality. They also add a surface area for cooking and preparing food as well as a unique type of storage! 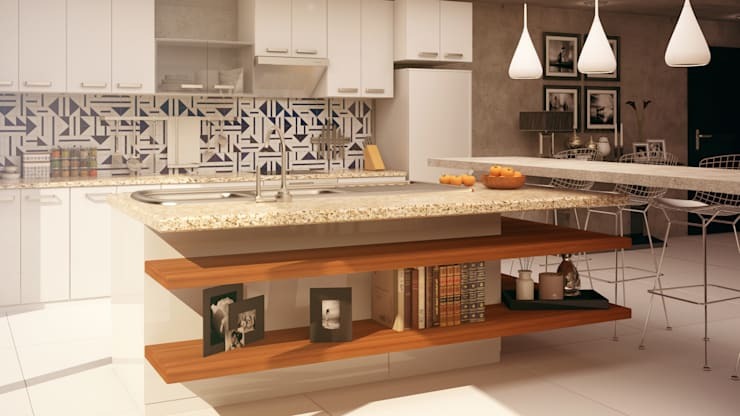 We suggest following this designer's ideas and place elegant shelves underneath the kitchen island. It's functional and decorative! If space is not one of the virtues of your kitchen, shelves can be a great way to store your appliances. A tailor-made modular design creates versatile cubicles that can be installed at a comfortable height for easy access. 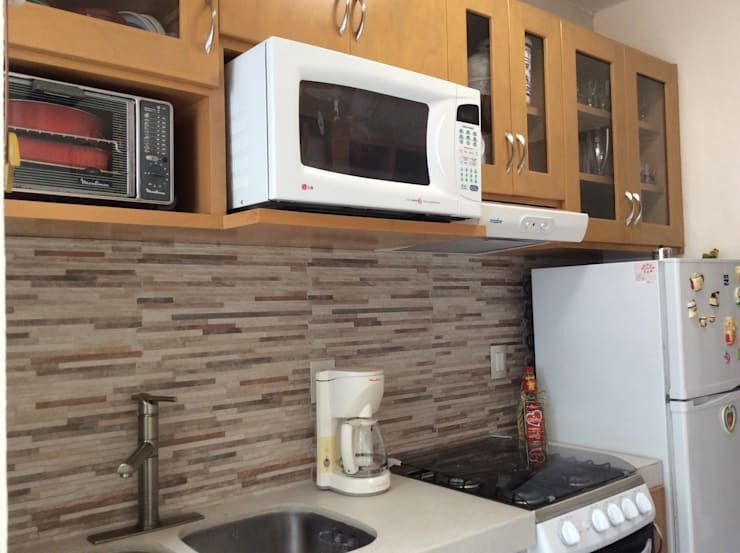 The microwave and oven for example, can be stored on the wall, making the most of vertical space. This will free up counter space, creating functionality and order! This design shows how a perfect balance can be created between functionality and style. Different materials come together to create a unique set of shelves. 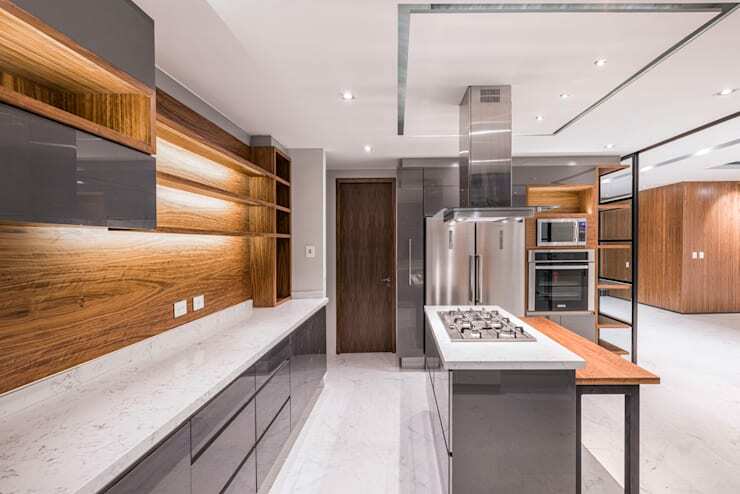 Completely custom-made these wooden shelves also feature recessed lights, which enhance the brightness of the wood and the elegant grey tones. 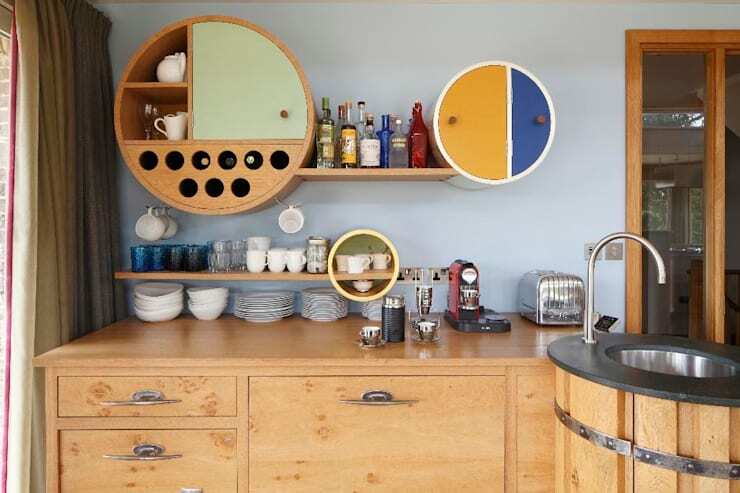 This eclectic and alternative design features bright colours and circular elements, which replace the linear shelves. This kitchen is full of personality! The circular elements were created as decorative pieces, while holding utensils, cutlery and crockery or even a few bottles of wine! Also have a look at these 8 clever ways to improve kitchen storage. 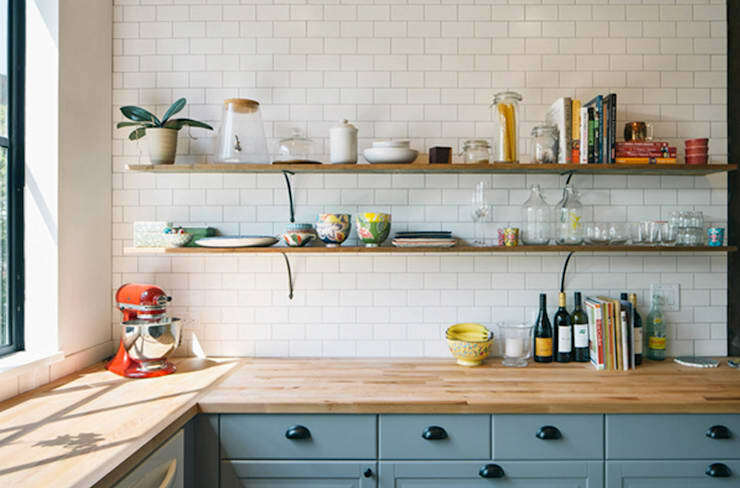 Which shelves would you choose for your kitchen?